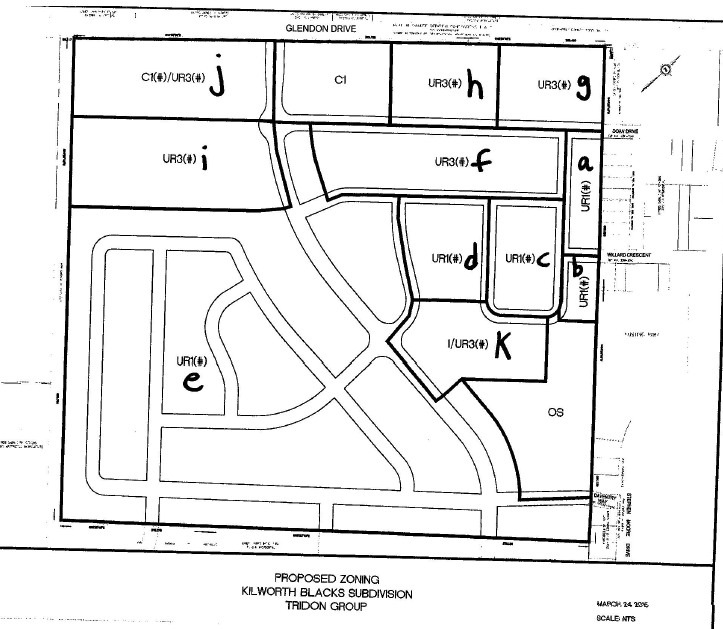 I attended last week’s public meeting regarding a revised re-zoning request being put forth for the Don Black lands. If you missed the first go around back in December 2013, just click here to see what happened then. 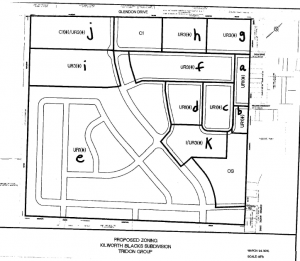 This most recent zoning application was a very, very different story from the first. On a side note, I was pleased to see some new faces amongst the crowd in attendance: some people I know but haven’t seen at a meeting before, some people that have recently moved to Kilworth, and others who have chosen to engage at this point. For reference, here’s the public information packet. I’m hosting it myself since I don’t know how long the municipality will leave it up on their website. This was the information distributed to council and the public prior to the meeting – council only received it on May 22, just five days before the public meeting. Why is there such a massive difference between the proposal from December 2013 and this latest proposal? It’s been almost 18 months since the original proposal came through. Why are we still at a phase where, really, there is no detail as to exactly what Don Black Investments and Tridon want to put on the land? Who will pay for the streetlights on Glendon, and the eventual enhancement of Glendon/Vanneck/Coldstream/Jefferies (a.k.a. Five Corners)? Jim C asks “Can I split an existing lot into a triplex?” Mayor says, “I don’t think you’d want that.” Jim responds “Exactly,” to a bit of laughter. How many cars is anticipated to exit onto Glendon Dr? 995 during AM peak time. This looks *nothing* like the original proposal presented December 4, 2013. I will say, on a positive note, that Daventry Way has been opened up. I appreciate that being taken into consideration after the last public participation meeting. On the other hand, the original proposal maintained a lot of flow with the existing settlement, and proposed wide path ways that would encourage active transport around the neighbourhood. In the documents we see today, those have been completely done away with. It appears that a 6 storey building is proposed for Block G. I fully understand the need for mixed housing, however a 6 storey building simply doesn’t make any sense outside of a larger community like Strathroy. People living in apartment buildings typically expect highly walkable areas, which, much as I enjoy living in this area, Kilworth and Komoka do not qualify as highly walkable areas, with Kilworth currently receiving a Walk Score of 9. The proposal doesn’t appear to contain anything that would significantly alter the Walk Score. Information about proposed heights for several blocks are missing from the proposal. The street design, frankly, is pathetic and will make the proposed settlement a nightmare to navigate. It doesn’t use the current set of best practices being used in the most walkable neighbourhoods worldwide. Overall, this proposal simply contains far too much density for the area. I was mostly in favour of the original, but this has taken a drastic turn for the worse. I was happy to defend the original proposal, despite its minor flaws, but I cannot, in good conscience, ask Councillor DeViet to vote in favour of this proposal as it stands before us today. That got a round of applause, as did many other statements made and questions asked by members of the public throughout the night. Mayor Edmondson had a hard time maintaining order at several points as people got fed up with the answers – and in some cases non-answers provided by Tridon. Needless to say it didn’t go well for Tridon and Don Black, and we hope the next version of the zoning application is very different. Whether the planner, Ben Puzanov, mandates another public meeting for the next iteration remains to be seen.